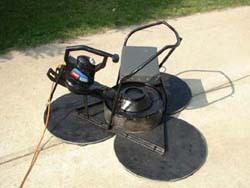 The purpose of this exhibit is to relate to visitors the uniqueness of hovercraft as well as their place in historical context. In addition, this exhibit was designed with attention being placed upon adherence to curriculum standards and benchmarks in science education in order to satisfy the needs of educators within the region who utilize the museum as an outside educational resource. To this end, a survey was recently conducted marking the one-year anniversary of the exhibit's installation in order to gauge the effectiveness of the exhibit as it was initially envisioned. As shown by the demographic profile, museum visitation stands at nearly 2500 during what is generally considered to be the museum’s slowest period. While not available at the time of the survey, interviews with the museum’s director, Jerry Mansfield, indicate that total attendance during the preceding 12 months stands at approximately 13,300, with more than 10,800 being accounted for during the preceding school year. Given that the target audience for this exhibit is at the 3rd through 5th grade level, all analysis of feedback and audience response will be done at that level. The museum’s director, Jerry Mansfield was asked a number of questions in order to determine the exhibit's effectiveness, educational value and content, as well as future direction. The following responses will be used to further evaluate content and will then be integrated into future exhibits regarding hovercraft. 1. How are museum visitors receiving the Hovercraft exhibit? 2. Is there any part of the exhibit that visitors dislike? Mr. Mansfield indicates that the only portion of the exhibit that may potentially bother visitors is the noise generated by the HoverChair; however, he also indicates that this is true only with very young visitors (usually under 2 years of age) and only for a brief period of time until they acclimate to the abrupt sound. Since this exhibit is designed for a much older audience, it may be appropriate to include a warning sign for parents/guardians warning them of the noise level of this exhibit. 3. What level of staff supervision is required for this exhibit? Initially, Mr. Mansfield indicated that a staff member or volunteer was posted at the exhibit continuously during the early phase of the exhibit. The ease with which the exhibit operates, however, has prompted staffing levels to be nearly eliminated during ordinary visitation and only during specific school visits will a staff member or volunteer be assigned to operate the exhibit. This is done more to facilitate orderly operation and to more effectively disseminate educational information. In addition, Mr. Mansfield also states that parents/guardians become more actively involved in the exhibit operation when the exhibit is left unmanned which, in effect, promotes more parental/guardian involvement and provides for a more rewarding experience. 4. How is the HoverChair holding up? “Remarkably well”, states Mr. Mansfield, “especially given the amount of traffic that it endures.” During the early phases of the exhibit, the HoverChair was equipped with a 7.5-amp motor, which was not particularly effective with older, more robust kids. 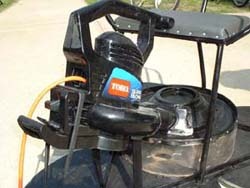 During the Spring 2003 break, a new 12-amp motor was installed. In addition, several other upgrades were added, including side rails, rubber bracket pads, a sharper angle skirt, foam padding for the seat, bungee cord motor mount, and a better seal for the plenum chamber. 5. Have the upgrades been effective? The aforementioned upgrades have dramatically improved operations, safety and overall appearance. 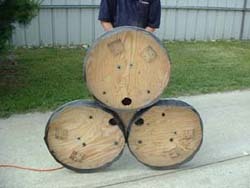 Analysis of the skirt material indicates that the greater motor capacity, along with the improved plenum chamber seal will provide for longer skirt life, necessitating fewer replacements over the life of the chair. The added side rails, along with the foam padding for the seat improve overall safety and give the HoverChair a better appearance. The new rubber bracket pads, along with the bungee cord motor mount have effectively eliminated any wear on the motor casing where it is in contact with any metal. 6. Has the signage been effective and has it held up well during the exhibit? According to Mr. Mansfield, the signage has been very effective in conveying information relating to hovercraft technology, history and the basic science underlying the exhibit. At this point there appears to be no need to upgrade the current signage. Mr. Mansfield did indicate that when brochures were available promoting the World Hovercraft Championship event, they were distributed very rapidly and he felt contributed to attendance at the aforementioned event. 7. Is any information missing? When asked if there was any information missing or any that he felt should be included which was not, Mr. Mansfield stated that the signage was very complete and quite appropriate for the school curriculum for which it was initially designed. In addition, he also stated that he felt there was no need to specifically design a pre/post visit teachers' guide until such time as this exhibit became a more active component of the museum’s school curriculum web page. This is planned for the following year. Both Mr. Mansfield and the exhibit's designer agree that if a larger exhibit is planned for a bigger facility, then curriculum guides, pre/post visit teachers' guides and Distance Learning programs should be a critical component of this style of exhibit. 8. What has been the most dramatic or effective single element of this exhibit? 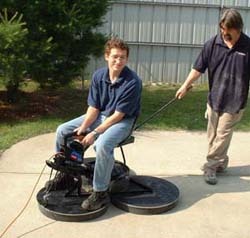 Mr. Mansfield states that when visitors sit on the HoverChair while it is not operating and are then asked to move the HoverChair, they are usually unable to do so. Then the HoverChair is turned on and the visitor is then able to move about on the HoverChair with virtually no effort. “This demonstration does more to convey how hovercraft work then any other portion of the exhibit and elicits more amazement than any other portion of the exhibit,” states Mr. Mansfield. As stated earlier, The Children’s Science and Technology Museum of Terre Haute plans on featuring the hovercraft exhibit entitled “The Science of Hovercraft: It’s Just a Matter of Inches!” as a major component of its school curriculum web page. In addition, a new facility for the museum is being planned which is being targeted for completion in 2006. Mr. Mansfield states that the hovercraft exhibit will receive its own dedicated space as opposed to its current status as a rotating exhibit. When this occurs, more signage, a display case, curriculum guides, pre/post visit teachers' guides and Distance Learning programs should be added to further enhance the effectiveness of this exhibit.